Updated, 11:59 p.m: Public comment invited; 7:46 p.m., comment from Doug Hempstead; 5:40 p.m.: Common Council Planning Committee plans to meet next week. NORWALK, Conn. — Construction on The SoNo Collection is expected to start soon, but the project will be simply a mall, no hotel included. Norwalk will receive a $3.5 million payment from mall developer GGP as compensation for the change in plans, a press release from the city said. GGP resisted having a hotel as part of its mall design, but needed to get the Land Disposition Agreement for the property, part of the Reed Putnam Urban Renewal Plan, changed to accommodate its use. City leaders insisted that a mixed use component remain as part of the LDA, and GGP officials expressed optimism about attracting a vendor for a boutique mall. As an option, the space could be used for residential or office use. Construction was initially promised to begin early this year. “The City of Norwalk (City) and Norwalk Redevelopment Agency (Agency) have reached an agreement with GGP, the developer of The SoNo Collection, to move forward towards the start of construction. The agreement removes the requirement for the hotel component of the project as well as the requirement to replace the hotel with an office or residential tower of equal scale. In its place, GGP has agreed to contribute $3.5 million to the City with the intention that the funds be used to benefit the community. The City is exploring how the $3.5 million contribution may be properly received and structured to provide the greatest benefit to Norwalk residents. The $3.5 million is in addition to the $550,000 circulator payment which was received by the City last week and the $1,022,500 payment for City easements necessary to receive a building permit. “GGP requested that the hotel requirement be removed because it is economically infeasible. Upon further review of economic and market data, it was determined that the alternative office and residential uses in a tower format on top of The SoNo Collection were also infeasible. Mayor Harry Rilling, Common Council leadership, the Agency and GGP worked together and determined that a contribution to the City would be an appropriate replacement. ‘We are excited that the project is moving forward and are looking forward to determining how we may apply GGP’s contribution to benefit our residents,’ said Mayor Rilling. Also, South Norwalk will still get a hotel as developer F.D. Rich Co. recently broke ground on the construction of a Marriott Residence Inn on South Main Street. Mayor Harry Rilling and Assistant to the Mayor Laoise King have said recently that they were meeting regularly with GGP, but had no news to release yet. The Council Planning Committee will have a special meeting Monday to move along GGP’s new plan, Redevelopment Agency Executive Director Tim Sheehan said. Planning Committee Chairman John Kydes (D-District C) provided an agenda, which shows public comment as the first thing on the agenda. The Council will have a regular meeting the following week. RDA Commissioners are being polled to see when they can meet to approve the changes, Sheehan said. Council member Doug Hempstead (R-At Large) did not know about the deal before being approached by NancyOnNorwalk before Tuesday’s Council meeting. He’s “not been privy to any meetings,” he said. “All I know is what I read, as long as they put something else inside the hotel then I don’t know why it’s not public anymore. All these negotiations at this point should be public,” Hempstead said. How, exactly, does a change of magnitude advance with no public scrutiny, and no public hearing? Did the city enter into a Land Disposition Agreement that gives the Mayor, Council Leaders and NRA the power to renegotiate the project and the terms? Folks, this is a disaster in the making. Nobody goes to a Mall anymore…………. Guess who is going to get caught holding the bag ( With no money in it) the taxpayers of Norwalk. It will close within 3 yrs after opening. So let’s see if a comparable hotel at 17 stories nearby pays $888k a year in real estate property taxes, our crackerjack city leaders think that a $3.5 million for one year is a good deal? Let’s just skip the personal property taxes that a hotel pays versus any retail for a moment, and just divide $3.5 million by $800k to get 7 years. By then who will be paying attention because plus the 2-3 year construction period, brings us to Norwalk in 2027. Maybe I’m missing something. Like the Maritime Aquarium will be moving from South Norwalk because of the Walk Bridge project, and so there’s no long-term vision that South Norwalk is a tourist destination, so the feasibility fo the hotel is in jeopardy. Of course, having the Aquarium be a part of the mall project would solve the tourist destination conundrum and the speculative issue that department store anchors are also not feasible. Having a brand new attraction that would bring people to the mall as a lifestyle center would be a good thing. But then why ditch the hotel? Norwalk has a cultural nexus that extends into day trips and excursions. There’s an awful lot of people in the greater NYC metro area that like to get away from the city for trips, that don’t require cars. So, take away those hotel jobs…and maybe hire a copy editor…. What will be in the space where the hotel would have been? Why is residential not an option? I am with Diane – how is it possible for such a major change in scope be processed without public participation. After all, it’s the taxpayer sstakeholders city, not P&Z’s. not Redevelopment or any other city agency. – a bit of arrogance that should not be accepted. A full public hearing is due, with all the financial issues available for review and comment! The “deal” may be OK, but on the other hand, not really in the best interest for the city. Again, the Council Planning Committee is meeting Monday. This would be followed up by a vote by the full Council. The Redevelopment Agency also needs to meet on this topic. Didn’t the original plan call for 30% commerical office space? And now it’s all retail, no hotel, and the “city” (who is the “city” if not the citizens?) is okay with what amounts to a change in the application? What next? Will GGP replace Bloomingdales with Dress Barn? Look at GGP’s project in Vegas… Michael Kors. Jimmy Choo. Burberry. OR we could end up with Spencer’s Gifts, Forever 21, H&M, Old Navy, and Men’s Warehouse. GGP’s plan, like old fish, smells worse by the day. Time to throw this plan in the dumpster and give Faye the open space she thinks Rilling is sending to Fillow Street. The agenda for Monday’s meeting includes public comment. Nancy C, a “Public Hearing” without the “facts” isn’t an adequate process. Whomever is in charge, Mayor, Redevelopment or, should issue a complete disclosure of the issue, Developers proposal, original approvals, and proposed financial settlement at least 10 days prior to any public hearing, to allow time for analysis. There are currently 2 malls being built in all of the US. This is a dying venture as Amazon continues to grow and our leaders are jamming it down our throats. Seriously- How much does Harry get for okaying this? On the side. Just one more blunder by the Redevelopment Agency among the epic failure of their existence. Yet, I doubt a single citizen will show up at the Planning Committee meeting or the RDA meeting to protest. I did that for years. It is a waste of time as long as Norwalk government allows them to go on. Our elected officials have shown, once again, that they don’t want public input. How can they encourage input when they announce the secret deal on a Tuesday, and then schedule public “comment” for a Monday, an “off night”, by the way, for the Planning Committee. Are they so bullied by GGP that this discussion must be pushed through, unvetted, in haste?! People, start emailing and calling the mayor and council members to demand a full public hearing on this matter, complete with a full presentation, including pros/cons, alternatives, risks, financial analysis, etc. Yessiree, someone call the cops – the council is apparently being held hostage by a developer, yet again. Yet once again, we have Rilling leading from behind. He was originally against the mall, then for some strange reason was for it. Now he is nowhere to be found. He should really do the right thing and resign so we can get a true leader as Mayor. 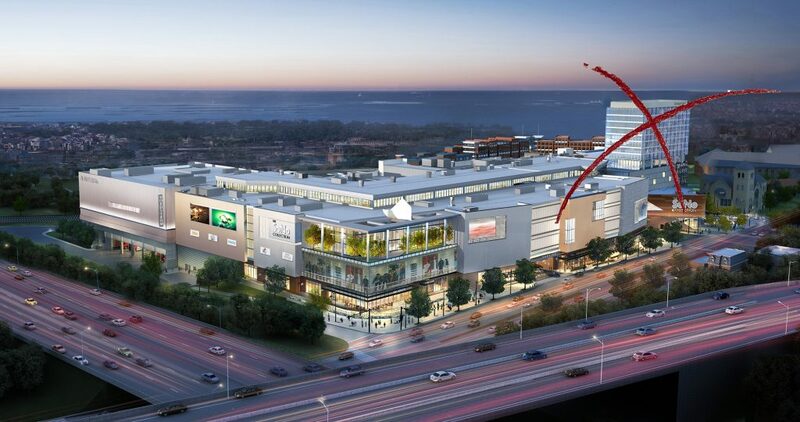 As the story above points out the mall will generate $2.5m per year in property tax for the first seven years rather than $5m per year without the enterprise zone that was brought to you by the Redevelopment Agency. That is $17.5m in tax revenue given away by the Redevelopment Agency in return for NOTHING. There was not even a viable development plan when that enterprise zone was put forth. Now the RDA has negotiated to let go what is probably the most valuable part of the development for a measly one time $3.5m fee. That means the property will be valued even lower and when the EZ expires we’ll be lucky to get anything close to $5m in property tax per year. Thank you @Bill Nightingale for adding the Enterprise zone info. I know there’s many people out there thinking, “but something is better than nothing” and yes having a mall would be a good thing for Norwalk. However there is a reason why real cities invest in planning, and don’t delegate that function to a subsidized agency whose sole purpose is to spark development projects. There are community city-wide needs to address. The misguided payment for a “circulator” to nowhere is a perfect example. Norwalk Transit already runs empty buses. Worse, agency considering extending Enterprise Zone again, north to West Ave and Wall Street and Head of Harbor. No wonder most developers there now are requesting extensions of time. Pays to wait (stall) in Norwalk…. Holding the council hostage with the too big to fail, and a parcel too long empty. Unbelievable. A regional destination that connects to the community eh? Sheesh, this sounds like the DMV….. Here are two more candidates for a new Norwalk Slogan: Norwalk….the path of least resistance! Put a train station on Wall Street and the tax revenue increase derived from the revitalization would surpass what the mall will bring in. At a cost of around $500,000 it’s the best bang for the buck Norwalk has seen in 4 decades….and will likely see in the next 4 decades. Something to consider. Forcing a developer to adhere to a preconceived development plan then dragging said plan out over a ridiculous amount of time will result in a crappy development. POKO is a classic example. Developers need to shift with a changing market or they are destine to fail. Stringing this out for another….2…3…4 years is the recipe for failure. The question we really need to be asking is why do Norwalk developments overseen by RDA always take so long? In development “time is money” . Since the development cycle shifts iradically what is feasible one year may not be feasible in the next year. Public meetings will drag this out for no benefit. The reality is no one in the public will have the time or resources to mount a credible critique of a development of this scale. But tieing up the process will diminish the end product. Don’t blame GGP. The problem is how we as a city handle the process. The last time you mentioned a Wall Street station, the cost was one million. Now it’s down to 500k. I agree that developments can get bogged down in permitting process. I witnessed this in Westport with the YMCA. However, in that case, while the first developer walked away after the town denied the Y’s application to build on Baron’s South, a different developer was engaged to redevelop the Y site after the Y moved to its new home at Mahackeno. Who’s to say that the first developer would have done more for downtown Westport than the second? Many see GGP’s dropping of the hotel from its plan as a fundamental change in the application, and therefore an opportunity to kill an ill-conceived project that will not benefit Norwalk. If GGP throws in the towel, that’s an opportunity for something better on that site with a different developer. POKO and GGP differ from each other by several orders of magnitude. In my earlier estimate I included restroom and waiting facilities built out in 16 River Street which are not really needed. To that I added a healthy dollop of “BS Cost” to account for governmental inefficiencies.